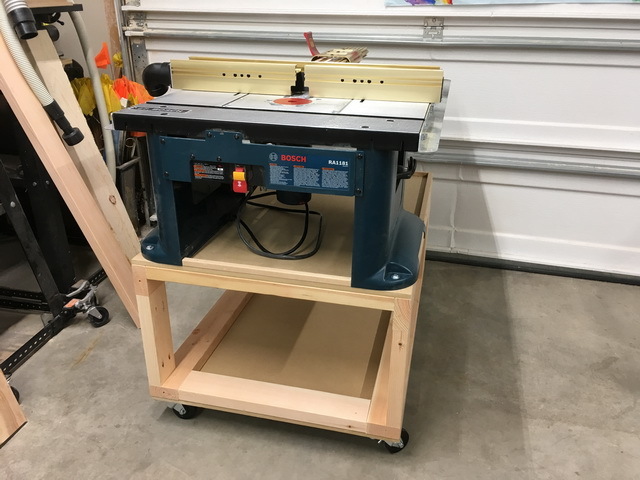 Back in Dec., 2018, I bought a Bosch RA1181 table along with a Bosch 1617EVS combo set for working on some birthday and Christmas presents. I was very pleased with both and have been growing into their use. I have added a Veritas Pin Router Arm and an Incra LS Positioner, which required building an extension off the rear of the table. However, that made the table very tippy in that direction. In addition, I was using the RT on top of a folding table or on a set of sawhorses, at about the same height. It was too high, uncomfortable to use. 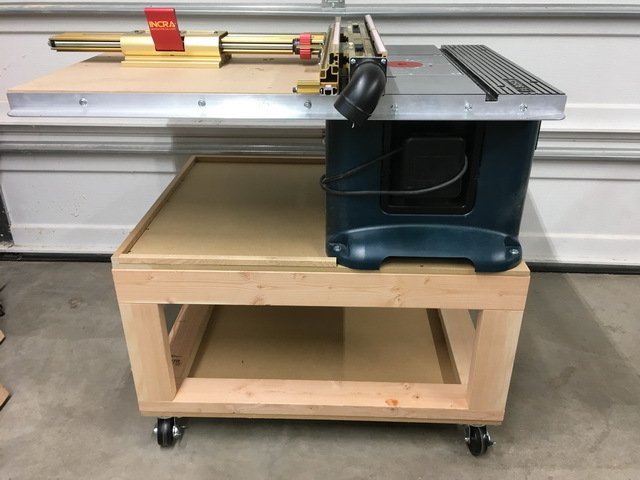 I just completed a mobile base for the assembly that solves the tipping problem by giving it something to be bolted down too. It also allowed me to put the table height where I wanted it. 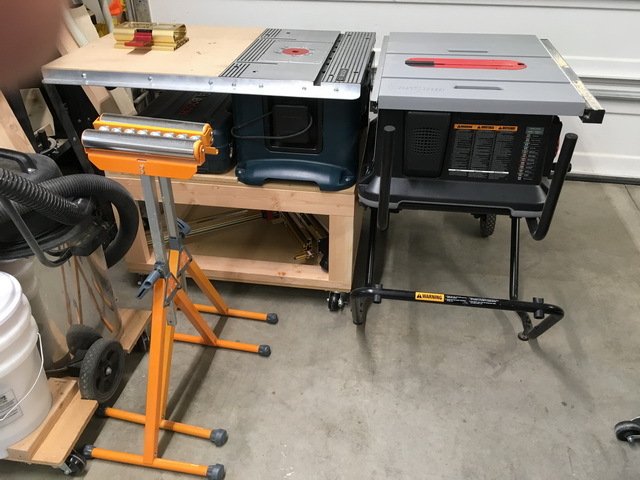 I was liking the height of the Sawstop Jobsite table saw and thought that would make a good height for the RT. Plus, I could use the RT as outfeed support for the TS. The mobile base also has room for stowing accessories, such as the LS when not in use and for the 1617 EVS combo storage box. Now, while the RT takes up the same floor space as before, it is at least mobile so it can be moved as needed. And that is very valuable in the limited space everything has to live and be used in. DaninVan, DesertRatTom and Herb Stoops like this. "If you want nice, clean, fresh oats, you must pay a fair price. However, if you can be satisfied with oats that have already been through the horse, that comes a bit cheaper." I sure like the way you did that. 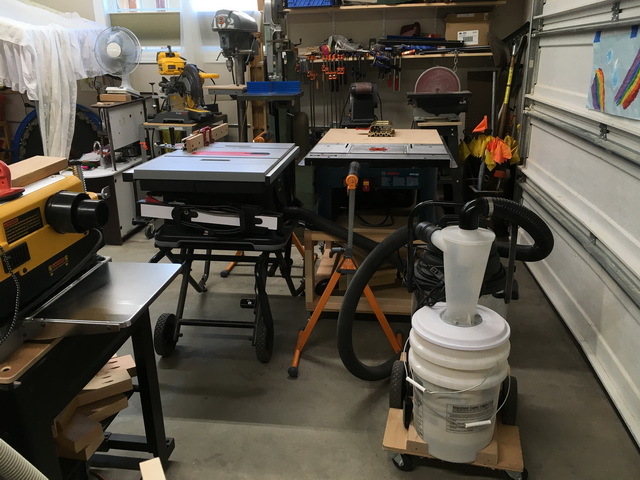 Mobile bases can be a very smart solution to tight shop space, and using it for an outfeed table is really smart. All of the above, Rick; nicely done, Sir!